Vision at night is difficult at best, whether you are watching wildlife or searching the sky for meteor showers. But it always seems you need just a bit more light to check the settings on your camera. Or to find the position of a constellation on your star map. The problem is that flipping on a flashlight ruins your night vision. It takes about 15 minutes for your eyes to adapt to the dark and see detail, and only a second or so of bright light to undo the process. Fortunately there is a solution. 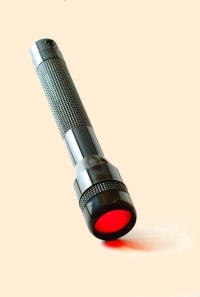 Dim red light has only a minor effect on our vision at night, so a red flashlight allows you to check what you just wrote in your notebook and still look up to see the animals that have better night vision than we do. And the animals are less disturbed by red light. I’ve seen advertisements for red flashlights, but a less expensive solution is to cover a light source with red cellophane or plastic. When I couldn’t find any locally, I bought a transparent reddish-pink file folder at a stationary store. Two layers did the trick. Enough light to see, but not enough to ruin my night vision.